I have long wondered whether I would have fared well in today's rugby Premiership as a young lad. The likelihood is that it would have taken longer to break into a first team like I did for Bristol many moons ago. I was playing student rugby and was invited to play some sevens for Bristol RFC. Having scored plenty of tries they wanted me to join the main club in the second team to see how I went. Within weeks I was playing for the 1st team in the Courage league. This would be unheard of in the present day league. A student being propelled into the Premiership from nowhere. Yes it was amateur then and profiling would have picked me up earlier as a England schools player, but nowadays I would have to outplay a seasoned international. For this reason amongst others, I would love the England RFU to be bold and buy Wasps and use the club status as an opportunity to make sure young English players are getting a chance. 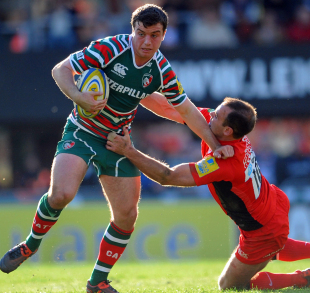 Look at George Ford at Leicester - he has to outplay the England number 10. He needs to be learning his trade in the Premiership to compete against Flood and the rest of the world. Is he good enough? Of course he is! Does he need to work on a lot of factors like defence and goal kicking-definitely. If he was Irish, Welsh, Scottish or form the southern hemisphere he would have been re-located to another team as there the players are centrally contracted. In England the player's loyalty is with their employer - the clubs. It is they who give them security all year round. The sub contracting of the club player to England means England (and France) are at a major disadvantage. Other countries can have complete control of their players including access near international time. I realise there may be a conflict of interest which I believe can somehow be overcome, but think of the team they could create with young English players as the backbone. They have the ground and facilities and would be able to keep their contracted coaches busy in the year. Unfortunately in the past it seems that the clubs are way ahead in terms of coaching than at England. Under Clive Woodward's rule the reverse was the case. With England he had the best of the best coaches in every department. Coming back to club rugby was very noticeable. Having a franchise like Wasps the England coaches (including the Saxons) could learn so much about the game and how to win. I am not suggesting that the RFU create an England team at Wasps, but that they use that franchise to their advantage with a few overseas players that can help improve the game of some of the younger ones with a priority to give the brightest kids in England a chance to play. England have not got long before the next World Cup to get the right players and coaches firing on all cylinders. I fear that the rumoured derisory offer to Saracens for Andy Farrell is symbolic of how the RFU want to go forward. They are the richest rugby nation in the world without any real direction as yet. It's time the new CEO took the bull by the horns and spent those millions on creating a brighter future for these young English players whom will not get a chance under the present system. Winning is everything. If the best of the English are not playing over the next few years, we reduce our chances of winning another world cup. Let's be the poorest nation owning the Webb Ellis trophy, rather than the richest needing to qualify for the next World Cup!